Scott Bright made the business case for LED lighting, which could provide savings in both energy use and maintenance. Turner Broadcasting System enlisted Scott Bright to evaluate lighting efficiency opportunities. By working with multiple stakeholder groups, Bright was able to determine the key factors used in selecting light fixtures and lamps used in office spaces. These factors include aesthetic qualities, energy usage, maintenance requirements and employee satisfaction. Using this information, he assembled a list of LED lights to be sampled and an analysis detailing the lifetime costs for each proposed light. Bright then evaluated current lighting systems used in office spaces and presented the business case for investing in LED lighting solutions. The analysis revealed potential savings of over 50 percent in energy usage and energy costs. Additionally, his research identified opportunities which could reduce office light maintenance costs and efforts by approximately 70 percent annually. In total, Bright’s analysis could allow Turner Broadcasting to invest in office lights that are energy efficient, durable, visually striking and ultimately create an improved work environment. 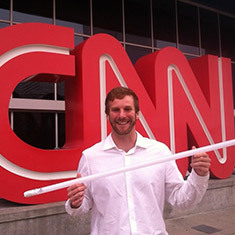 Scott Bright, a student at Presidio Graduate School, was hired as the 2013 EDF Climate Corps fellow at Turner Broadcasting System.